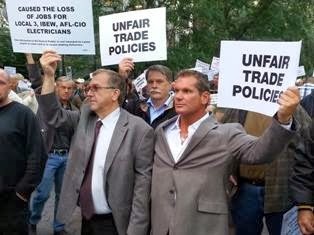 IBEW Local 1212 Business Manager Ralph Avigliano and Business Reps John Costa, Vincent Butler and Executive Board member Phil Doyle are seen here attending a rally outside of the United Nations for their Anti-Union policy. The demonstration by local union leaders stands up for the loss of jobs in the IBEW Local 1212 and Local 3. Members who proudly served the United Nations for over 65 years. United Nations workers spend their time on the front lines of the global struggle for human rights, but now they are battling for rights in their own workplace. The UN has come under fire for union-busting, and the labor standoff could undermine its ability to uphold the rights of others around the globe. All summer, the United Nations' staff unions have been clashing with management over a new policy aimed at curtailing the staff’s collective bargaining rights. The Staff Coordinating Council, the union leading the opposition campaign, contends that the loss of this negotiating power, enacted by Secretary-General Ban Ki-moon, would deal an unprecedented blow to the union’s power to negotiate contracts and working conditions. The dismantling of union power, in turn, may signal a gradual shift away from democracy and toward neoliberalism throughout the institution often hailed as the world's watchdog. According to the unions, when they declared the reforms unacceptable, management broke off talks. In July, the UN went ahead and enacted the rules. According to the Staff Coordinating Council , Ban had made far more drastic policy revisions than what the General Assembly had mandated. They say the order simply serves as a pretext for Ban to undermine the union’s influence, and that he has operated outside of the UN legal framework, which would require him to “seek mediation before consolidating this mandate." Now, UN employees—from office staff to peacekeepers to humanitarian aid workers—are waiting anxiously to see how the reforms will affect their power to determine the conditions of their work in a massive global governing structure. Prior to the new policy, UN staff's contract negotiations were similar to that of civil service unions in many member states, though the negotiations were not completely binding since the General Assembly could technically override the labor agreements. The loss of these collective bargaining rights has provoked international outcry from labor advocates, including the International Trades Union Congress. Collective bargaining: A human right? In order to continue this work, staff must feel valued and treated with the same dignity the UN encourages other organizations to treat their staff. Without a fully motivated and engaged staff, the results on the ground will change dramatically. The workforce of the UN is dedicated to its mission…. Everyone has the same goal. Many labor issues are effectively on hold due to the breakdown of the talks. The staff union had wanted to address concerns over the UN’s the growing reliance on private security contractors in its military missions. Unions were also demanding “better protection for whistle-blowers” and stronger oversight mechanisms, and “a workable screening system” to prevent agencies from employing people convicted of war crimes and other human rights violations. The anti-union shift at the UN seems to run counter to its outspoken stance on labor rights in the private sector, such as its recent criticism of Bangladesh’s weak worker protections following the Rana Plaza factory disaster. The UN Global Compact, an initiative that advises businesses on human rights issues, proclaims that “Businesses should uphold the freedom of association and the effective recognition of the right to collective bargaining." This is, of course, not the first time the UN has come under fire for political hypocrisy—in recent years, agencies, both staff and leadership, have been scandalized by various cases of human rights violations, including misconduct by peacekeeping forces. But the new labor policy is more than just the UN's failure to walk the talk on labor rights. The reforms seem to reflect a global neoliberal trend among some member states. The undermining of collective bargaining at the UN follows labor crises in public sector unions in Europe and echoes Wisconsin’s pivotal anti-union law. Unions argue that it reflects a general pattern of eroding job quality and security at critical agencies, and ultimately, will damage the staff's effectiveness. In Richards's view, UN workers’ rights have been quietly deteriorating amid a trend toward privatization: While agency budgets are threatened by deep cuts, the UN's military missions increasingly rely on controversial private contractors like UK-based security firm G4S. Many staff have chafed at the administration’s restrictive “mobility policy,” which governs staff members’ freedom to change positions within the organization. Ironically, the labor dispute has emerged just as the UN revisits a historical moment of crisis facing its workers: Last month the UN marked the tenth anniversary of the bombing in Baghdad that killed 22 staff members. Ban's commemoration speech, quoted in the New York Times, specifically referenced the need to address security threats to field staff : "We have learned from our losses… We are changing the way we operate around the world." But the UN staff's advocates see the loss of collective bargaining rights as a change in exactly the opposite direction—a measure that will make staff physically, as well as economically, less secure, in working conditions that are by definition fraught with instability. Given its symbolism on the global stage, Richards says, “The UN is supposed to set an example to the world. Right now on labor rights, it isn't." Michelle Chen is a contributing editor at In These Times, a contributor to Working In These Times, and an editor at CultureStrike. She is also a co-producer of Asia Pacific Forum on Pacifica's WBAI. Her work has appeared on Alternet, Colorlines.com, Ms., and The Nation, Newsday, and her old zine, cain. Follow her on Twitter at @meeshellchen or reach her at michellechen [at] inthesetimes [dot] com.